Instant Pot is known for reliable and durable products. They’re a Canadian based company who strives for safety, convenience, and dependability. Instant Pot is also a green friendly company, creating products that save up to 70 percent energy. Instant Pot is famous for their pressure cookers and dedication to making your life easier, but they also make an exceptional immersion circulator. Immersion circulators are a critical part of the Sous Vide cooking process. 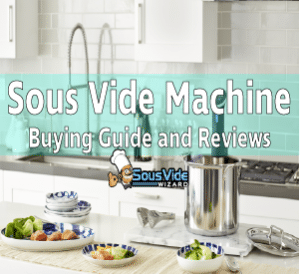 Although Instant Pot is known for pressure cookers, I’m particularly fond of their Accu SV800 Sous Vide Immersion Circulator and I’ll tell you why. After trying many sous vide circulators, I’ve found this one to be the most user-friendly, reliable and accurate. It clips right on the side of any pot and features a touch screen interface, something I haven’t found anywhere else. The Accu SV800 also has a rubber handle, meaning you won’t burn yourself when you’re ready to take it off the pot. Adding to its user friendliness, it is incredibly easy to clean, just let it air dry. It is also extremely reliable and can continue running nonstop for up to 72 hours, perfect for even the biggest meals. The Accu SV800 is extremely accurate in temperature control. It can keep a pot of water at a steady and even temperature, give or take one degree, between 104 and 194 degrees Fahrenheit. I also love the sleek design. Another great part about the Accu SV800 is its ability to operate almost silently. This is perfect for when you’re having guests over. 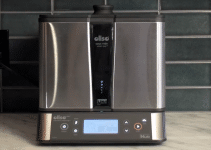 You don’t want a loud sous vide machine killing the vibe of your elegant party. And speaking of dinner parties, this will make perfect gourmet meals for your guests and leave them begging for more. I had friends over several months ago and they’re still asking how I made the chicken we ate. I told them how I did it, but they don’t believe me! They can’t believe how easy it was to make such a delicious meal. You’ll find the Accu SV800 has lasting power and will satisfy all your sous vide cooking needs. Needless to say, I highly recommend this fantastic product to everyone reading. I can’t stress enough how amazing the Accu SV800 is; you have to try it for yourself. Sous Vide cooking provides you with perfect results every time, evenly cooked gourmet meals right at your fingertips. The Accu Sv800 takes the hassle out of gourmet meals, and although it won’t make you a professional chef, you sure will feel like one and everyone will think you are. 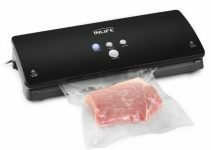 Whether you’re just learning the ways of sous vide cooking, or you’ve been doing it for years and are looking to hone your skills, this product is perfect for you.